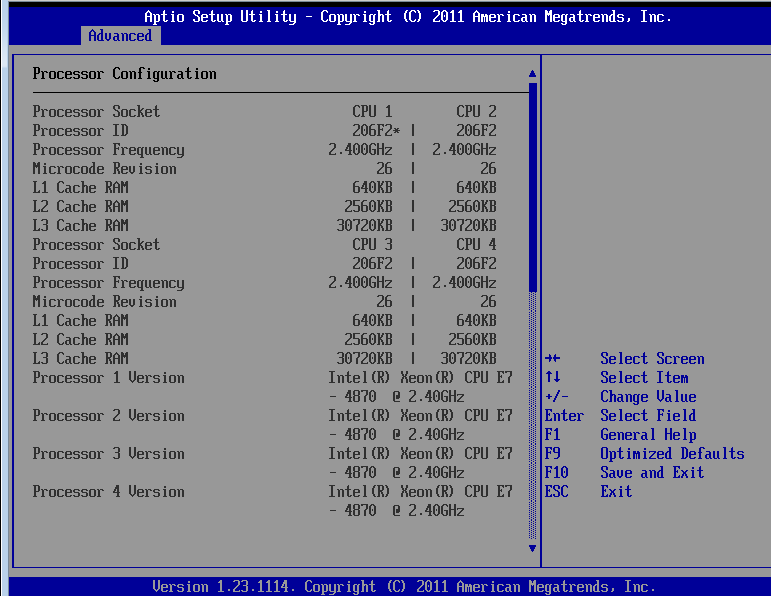 And believe it or not, but the massive HP DL980 G7 (8 Proc Nehalem/Westmere EX is actually running 4 pair of EX CPUs. HP has a custom ASIC Bridge chip that brings them all together. This design MIGHT actually support running the 2P models as each Pair goes through the bridge chip. If anyone wants an explanation of what changed between these types of memory, simmtester.com has a decent writeup and illustrations. Basically each LR-DIMM has a private link to the buffer chip, instead of each dimm having a very high speed buffer daisychained to the next dimm on the channel. I love the link but your comment is a bit misleading. 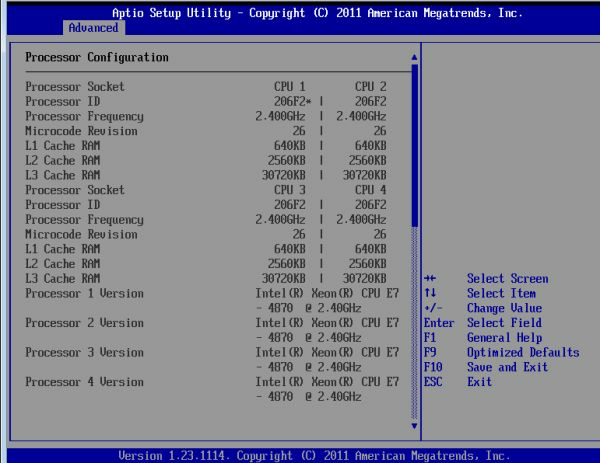 The main difference isn't the removal of the point-to-point connections but the reversion to a parallel configuration similar to classic RDIMMs. The issues with FBDIMMs stemmed from their absurdly clocked serial bus that required 4x greater operating frequency over the actual DRAM clock. Correct me if I'm wrong, but isnt an Opteron 6174 just $1000? And it is beating the crap out of this "flagship" intel chip by a factor of 3:1 in performance per dollar, and beats it in performance per watt also? And this is the OLD AMD architecture? This means that Interlagos could pummel intel by something like 5:1. At what point does any of this start to matter? That's only true IF the programs/applications that you're running on it isn't licensed by sockets/processor/core-counts. The analysis isn't too hard. If you're licensing things on a per core cost (Hello, Oracle, I'm staring straight at you), then how much does the licensing cost have to be per core before you've made up that 20k difference in price (assuming AMD = 10k, intel = 30k)? Well, it's simple - 20k/8 cores per server more for the AMD = $2500 cost per core. 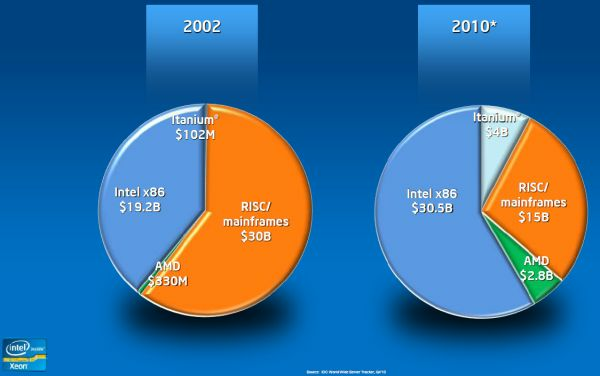 Now, if you factor in that on a per core basis, the intel server is between 50 and 60% faster, things get worse for AMD. Assuming you could buy a server from AMD that was 50% more powerful (via linearly increasing core count), that would be 50% more of a server, but remember each server has 20% more cores. So it's really about 60% more cores. Now you're talking about an approximately 76.8 core server. That's 36 more cores than intel. So what's the licensing cost gotta be before AMD isn't worth it for this performance level? well, 20k/36 = $555 per core.